Just about every time a new acquaintance learns of my involvement in this thing we call The Heavy Petting Zoo, I get the same question: “How did you ever get into that kind of music? 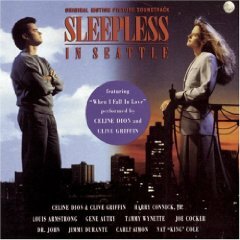 !” Many factors contribute to this part of my personality, but for the purposes at hand, I like to point to the Sleepless In Seattle soundtrack as the original culprit. It’s the first CD I ever listened to repeatedly that featured the likes of Jimmy Durante, Nat King Cole, and Louis Armstrong. This soundtrack is quite popular. Granted, those who fawn over it tend to be the ladyfolk — the same people who gush over the film. But I swear, it’s undeniably enjoyable… even if you’re not a chick. So, for those stuck in the 21st Century — those who fear that listening to old music means being Suzie Homemaker or dancing the jitterbug — let this be a primer. It won’t kill ya to listen. I promise.